A bobber rolling chassis is the way to go if you don't want to bother with building a frame, and get a head start on the building process. If you don't know what a rolling chassis is, it's an incomplete partially built bike ready to be customized. A rolling chassis can include the wheels, gas tank, handlebars, frame and other essential parts. It will need to have a transmission and engine added before you add your custom parts. 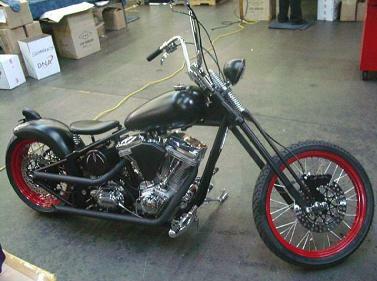 A bobber rolling chassis is the best median between building from nothing and buying a bobber kit. They are going to cost less than bikes made from kits, but still give you the foundation of parts that have been pre-selected. A great way to learn how to build a bobber is to get a bobber rolling chassis because you can build and customize it over time as your budget permits, and you'll learn a great deal. While a bobber kit is a one time cash drop, just like buying a bike. It's a great way to go if you have the money or you want to finance it. Heck, you get a killer bobber at a discount. But you dont have the luxury of customizing it as much. Building a bobber frame requires more skill, tools, and plans. It's only foradvanced metalworkers. When it comes to a bobber rolling chassis, and since all you are given is the basic framework, however, you still have all your options for customization. The chassis will establish the overall feel and look of you custom bobber. If you are thinking of building a bobber from scratch or from a bobber kit, you may want to consider a bobber rolling chassis to mold your design around. There are many styles to choose from. Each will fill a certain design need and help you make your bobber custom to you. It all depends on the style you are going for and how you will be using your bobber. As you shop around you will hear them referred to in terms of stretch. The amount of stretch chassis has in its downtunes is how much higher it is than a stock frame. When it is the stretch that is in the backbone it is how much longer the frame is then a stock model. Rolling chassis's are going to include any frame that is a softail or rigid motorcycle frame, that includes rear and front wheel assemblies, as well as stretched front downtubes and backbone. When choosing the right frame for your custom bobber, you need to first think about the total weight the bike will be upon completion. The weight of a completed bobber will have a huge impact on what kind of rolling chassis you will want, depending on how smooth you need the ride to be when you are done. Usually, the heavier the bobber rolling chassis is, the smoother the ride will be. However, if you plan to race at all, you may want a lighter one. The frame (chassis) will be the backbone of any customer bobber you build. Since you have to choose all the pars that to go with it, it can require more skill then a bobber kit that comes with everything you need. With a bobber rolling chassis you may have to do some research into what kind of parts will work best with the frame you have chosen. It is essential that you choose a quality frame chassis that will last. CHOPPERS: WHAT’S IT ALL ABOUT? Get Your Frame Registered and Titled in the US! So you want to build a custom chopper? I do too, so the first question I asked myself, is where do I start. Should I make a business plan, a schedule, a financial statement, or should I just buy my wife some flowers and blindly proceed?